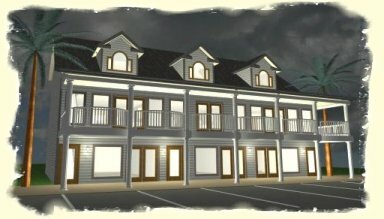 Business/Residential Complex-Pelican Watch-RD040721-Carolina Coastal Designs, Inc. This Business/Residential complex will consist of two(2) buildings with street level business units with duplex residential units above. This project, scheduled for completion in 2007, is located at 50th St. & East Oak Island Drive on Oak Island in North Carolina. The first building of this complex will be 60' wide x 52' deep. The main level will contain commercial units. One will be a double sized unit of 1352 sq. ft. and the other will be a single unit of 616 sq. ft. Both units have their own back door and contain bathroom facilities and a separate HVAC room. A common covered walkway is provided along the front adjoining the parking lot. The three duplex residential units have individual entrances from the common walkway. 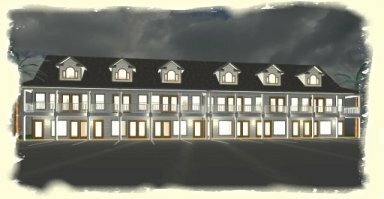 These 3-bedroom, 3-bath units are split between two levels, with the living areas and the master bedroom suite on the main level and two bedrooms and two additional bathrooms on the top level. Walk-in closets and attic storage is provided. A covered porch, opening from the living room, graces the front of each unit. The second, 120' building, will provide two double sized and two single sized commercial units, along with six residential units as described above. Click here to visit the Southport-Oak Island Chamber of Commerce.